Ooo-La-La, A Taste Of France! Whether you are looking for romance, a fun time with friends or a short family vacation, it would be hard to beat this quick break for a flavor of France - short of flying to Paris itself. We have included a carefully curated selection of the best tours and adventures in each city - so you can both enjoy your freedom and make the most of your brief time in ‘New France’. Montreal is the commercial hub of French-speaking Canada – brimming with joie de vivre and French flair. There are so many festivals and events here, when you call we’ll tell you what’s going on when you plan to visit – and take care of the arrangements if you see something you like. With its cobbled streets, its historic citadel and its fascinating museums, Quebec City is arguably one of the most ‘European’ cities – and definitely one of the most romantic – in North America. It is also a great place to learn about the history of France in Canada. Getting there is half the fun and rather than a drive from Montreal to Quebec City we suggest you sit back and relax as your train meanders along the majestic St Lawrence River. Your Quebec vacation begins with your arrival in Montreal. Spend your day exploring the cobblestone streets in the Old Port or walk down lively St. Catherine Street, lined with shops and sidewalk cafés, and then sample the fine cuisine and exuberant French Canadian nightlife. Enjoy the convenience of a private driver to greet you at the airport and transfer you by private vehicle to your Montreal accommodation. Enjoy the day exploring the beautiful history and culture that Montréal has to offer. Board Via Rail Canada’s The Corridor train bound for Quebec City. Enjoy the beautiful scenery as the train carries you at an ideal speed to take in the views. 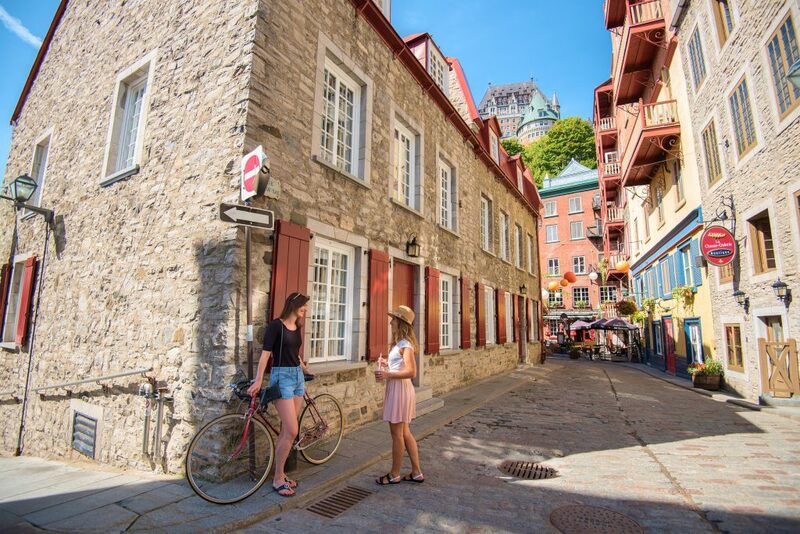 Take to the cobblestone streets today to explore the quaint neighbourhoods of Lower and Upper Quebec. With its rich history and stunning architecture you will fall in love with this beautiful city. Too soon, your wonderful experience in French Canada comes to an end – to be re-lived in memory over many years. Small Group Montreal Sightseeing Tour is available between May 23 and October 19, 2019 Tuesdays and Thursdays. Montreal Highlights by Bike tour is available between March 31 and October 30, 2019 departure dates. All of the planning and preparation that you so patiently helped us with certainly paid off. Everything went off without a hitch and we thoroughly enjoyed both Montreal and Quebec city. So we wanted to thank you for all your help. It is greatly appreciated and we are already telling everyone about your great company and even better service.